Psychodrama is a form of therapy. Jacob Levi Moreno founded the the early forms of the philosophy and practice in Vienna early in the last century. 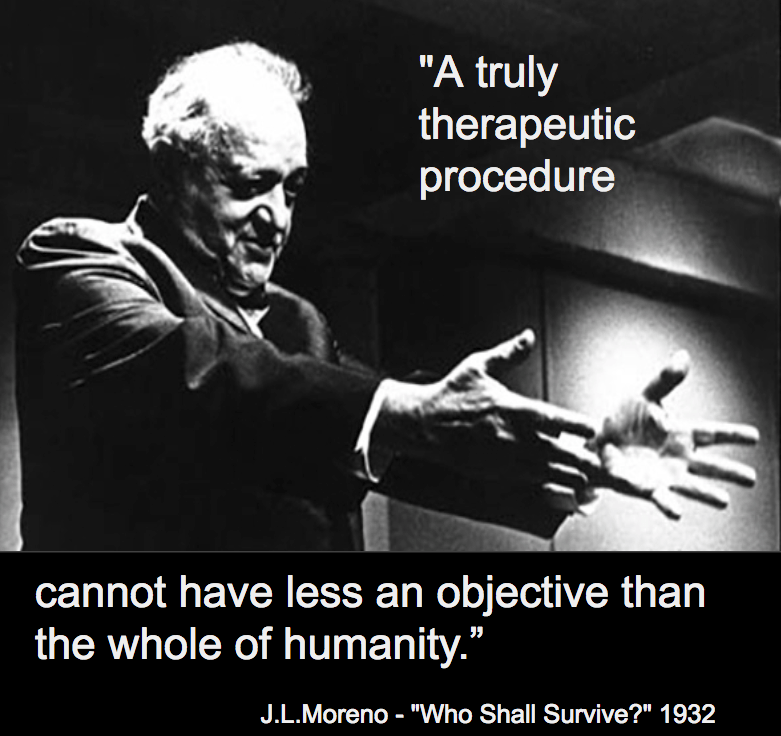 On page one of his seminal book: “Who Shall Survive?” he wrote about a therapeutic procedure. Psychodrama is a term that can cover any of the following: psychodramatic group work, a scientific approach to relationships called sociometry, group psychotherapy, dramatic explorations of society in a method called sociodrama. In its long history and development other forms were entertained… encounter, improvisation, sociatry, bibliodrama, music drama. What ties the various flavours together is the focus on relationships. Psychodrama may not be the only or best word that could describe the whole field but it has become the best known and most widely used term. In Australia and Aotearoa New Zealand the Training & Standards Manual for Psychodrama uses the term Psychodrama generically to cover four specialities. These four disciplines are interrelated and are taught to all trainees. The specialisation that occurs is usually related to the occupation of the trainee. Some specialties are more suited to psychotherapy and counselling, others to education and others are suited to organisational development and consulting. All specialities can lead to work in the creative arts. Clearly psychodrama is more than psychotherapy, it is a form of working with social change in many spheres. Psychodramatic methods have a strong focus on experiential learning and on practical methods that encourage lively expression of thought, feeling and action. Moreno was a deep thinker and prolific writer, theory and philosophy underly the work and can’t be separated from the techniques. Writing that is clinically sound and at the same time inclusive of the experience of the writer is essential to becoming qualified. A Journal has been published by AANZPA and is now in its 26th year. Well over a hundred thesis have been written in Australia and New Zealand. Psychodrama has theatre as a central mode of practice and theory. (Note how this contrasts with the origin of other therapies in medical practice.) People have used theatre to connect, to tell stories, make meaning and enliven the spirit for many centuries. Theatre fosters a relational, holistic response to life. Group members take up the various roles of what is happening. There is an opportunity to experience all the thoughts, feelings and actions. Being able to stand back and literally see all the factors that contribute to a situation makes it possible to think, feel and take new actions. There is a freeing up of the old and an entering into new possibilities. While it is more than psychotherapy, psychodrama is a solid psychotherapeutic modality. Psychodrama qualification is a pathway to legal registration as a psychotherapist in Australia by PACFA and in Aotearoa by PBANZ. 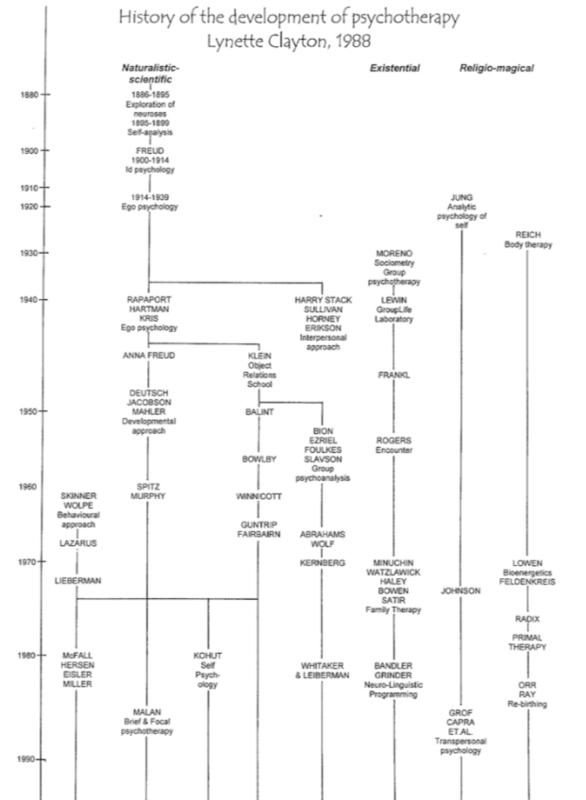 This chart “History of Development of Psychotherapy” by Lynnette Clayton one of the pioneers in bringing psychodrama to Australia and New Zealand, shows how the work of Moreno is at the foundation of a line of psychotherapy. It has a lineage of its own, that does not go back to the inter-psychic work of Freud. Lynette calls the lineage existential. Today many would call the method the first in a relational paradigm. One of the difficulties psychodrama faced is that it was a relational method born in the highly individualistic twentieth century. The need to unite in the face a threatened planet means that now is the time for psychodrama to flourish. Here is a diagram of the distribution of some of Moreno’s concepts within a therapeutic space showing the depth and breadth of the method. The diagram is from “Psychodrama Since Moreno: Innovations in Theory and Practice” (Kindle Locations 2521-2522). There are psychotherapist and counsellors in all the cities and major towns in New Zealand who are qualified psychodramatists or who have had extensive training in psychodrama in addition to other modalities. Many people who work with organisations have trained and qualified in sociodrama and sociometry. Community workers, managers, educators and social worker benefit enormously from psychodrama training.